I have seen arguments that German naval radar was actually on a par with US fire control radar as far as accuracy goes. Take Tirpitz instead of Bismarck if you want ships at the same date. However German radars tended to fail a bit more often and from what I've read they didn't have as many reduntant sets. The US doctrine of engaging in long range fire I think would be a critical factor especially if you consider any likely strategic situation. A US battleship enagening a German one in WWII wouldn't really have to worry about holding back enough ammo for a second engagement while a German battleship especially if it's on a raiding cruise couldn't afford to shoot up most of its ammo unless they were ready to return to port anyway. A long range engagement would also tend to offset Bismarck's rate of fire advantage while emphasizing the advantages of the US "super heavy" AP rounds. A knife fight could go either way pretty easily but in a long range engagment I think Iowa or for that matter any of the US fast battleships has the edge. Alright, I'll admit, in regards to damage control, there never seemed to have been extreme cases(That I know of) of Kriegesmarine ships suffering damage similar to say what New Orleans took at Tassafaronga yet still managing to make it back home, so the damage control aspect is uncertain. So, yes, the Germans did know a thing or three about damage control. And if you go back to WWI there's that picture of Seydliz (?) 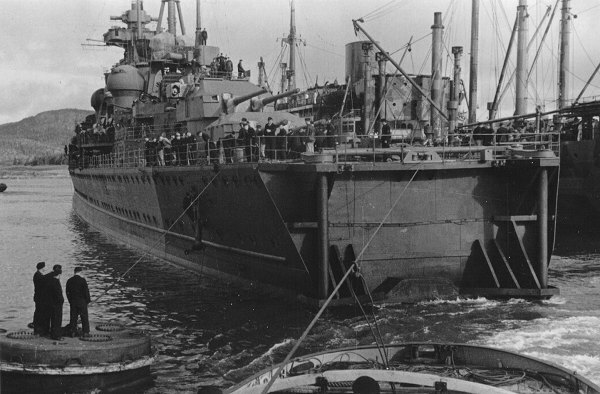 entering port with her decks awash. 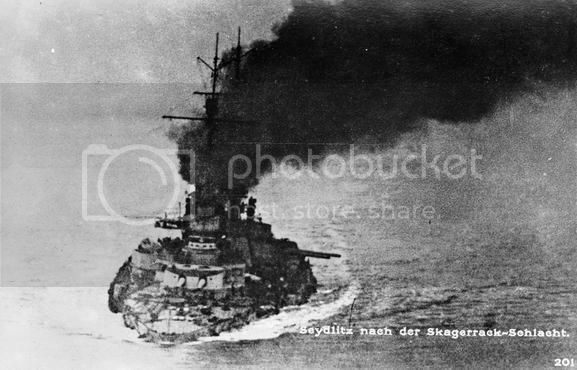 Part of it seems to be though that the Germans build very tough ships in terms of how much damage it took to sink them. I'm not sure just what their damage control doctrine was though. Great stuff guys. Keep the information coming!!!! I've read that some of the toughness of WWI German ships was from their extream compartmentalization. They spent long periods in port with their crews living ashore in barracks. British ship had to be more habitable with larger open areas such as mess decks since their crews often spent many months on them. 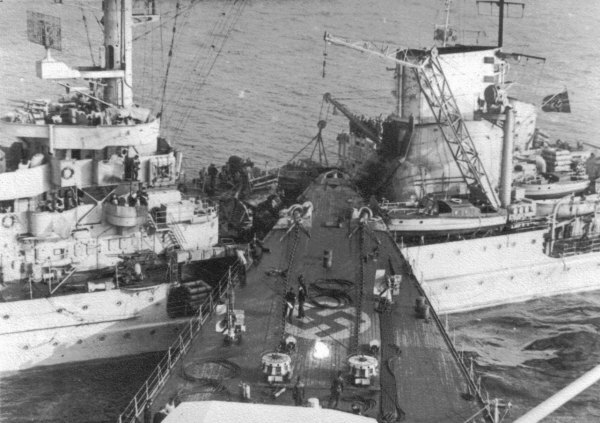 The guns, roof, and rear armor of the forward turret were purposely removed to lighten the ship's bow, because it was so low in the water that it prevented her from entering port, or was it possibly the dock. Alright, fair enough, thanks for the heads up, I'm not as much into the Kriegsmarines aspect of WW2 as I am into the US Navies. I know Bismarck had her own gunnery radar and damage control, I wasn't saying she didn't have either, what I meant was that Iowa had superior RFC sets in the form of the Mk. 8(when she was commissioned) and the late war Mk. 12, which were certainly more advanced than the sets Bismarck had at the time of her loss, in addition to this, Iowa(and all US fast BBs of WW2) had advanced stable verticals that enabled her to maintain a solution on a target even while conducting evasive maneuvers, while the battleships of other nations could only do one or the other ,which is a big advantage for any warship. Also with that 30% more energy from the Mk. 7 16"/50, combined with the heavier shell(Mk. 8s 2700 lbs vs. L/4,4s 1764 lbs) makes Iowas guns more potent, so with the other two advantages noted, I maintain my position in favor of Iowa. Alright, I'll admit, in regards to damage control, there never seemed to have been extreme cases(That I know of) of Kriegesmarine ships suffering damage similar to say what New Orleans took at Tassafaronga yet still managing to make it back home, so the damage control aspect is uncertain. There is no question that the US-late-war radar was better than any german radar set from 1941. Additionally the ppi presentation allows for easier determination of simultaneous impacts compared to the A-scope of the Seetakt. By 1944/45 the Berlin devices had also PPI wich was capable of detection of single buoys, wich wer used for marking routes in minefields. The firecontrol radars becam also more advanced at this time but ther was a lack of ships to be used. -they could feed the C 38 firecontrol computer with rangedata as well as bearing data of potential targets and had splash detection capability. In several service regulations the performance data for a FUMO 2 with small antenna and standard electronics are given with 30 km detection (Entfernung Grob) range and 20 km for measuring range(Entfernung fein). Ranging accuracy(Enfernung fein) was in the order of 50m despite of the 300m signal lenght due to triangular waveform of the sending pulse. From the war diaries of shore based artillery batteries at Sangatte (Batterie Großer Kurfürst -28 cm) it became clear that they could measure targets near Folkstone(distance >30 km) and also detect splashes at this distance in Summer 1941. The so called Zielbeobachtungsschießen became difficult when the enemy starts jamming the german radar sets. Another battery (10,5 cm) near Oslo mentioned an unusual event. They fired two shots against a unknown naval target at a midnight at around 10 km distance. Instead of two impact events they detected 6-8 splashes. A investigation at spot next morning yielded the result of several mine explosions caused by the impacts. This also means that range resolution must be better than the 300 m mentioned in the regulations. The german cruisers in the baltic used radar beacons as orientation point for shore bombardment (better inland bombardment at 25 -30 km distance against soviet targets; in some occasions enemy targets at minimum distances of 400m from own units were bombarded. Impact observation by artillery observer. This capability also applies to german fire control used on capitalships. Corresponding tests were carried out by Prinz Eugen in 1944 if memory serves. Its mentioned by Paul Schmalenbach (I. A.O. Prinz Eugen - Die Geschichte der deutschen Schiffsartillerie). With regard to advantages of the allies, the disposed german standstill in development in 1941/42 enabled the allies to surpass german development especially with regards of wavelenght and signal strenght. Hm, impressive, are there any good books on the German Kriegesmarine and the development of naval-based radar during WW2 that you can suggest? I can't seem to find the photo I was talking about right now. As I recall it was higher resolution and parts of her deck were litterally awash (specifically between the bow and the bridge). Perhaps it's not as famouse as I thought. No. It was taken from the port side and you could see the bow clear of the water with the deck around the fore turrets awash if I remember correctly. It was taken as she was entering bort from what I recall. I have seen the picture several times in different sources but can't seem to find it now. oh how 'bout this: the US has just entered the war and already launched iowa. the ship is dispatched to norway to take on the tirpitz or some other "bismark-like" ship. in command is an admiral in the same mold as kimmel, short, macarthur, crutchley and turner. the german ship brings the fight to her unexpected and, using the bismark's high velocity and low angle advantage, knocks the iowa deaf dumb and blind. Could you explain Bismarck's advantages a bit? Her 38cm did have a higher muzzle velocity, but the shells were just under 2/3 the weight of Iowa's, and Iowa's armor penetration was superior across the spectrum. Her armor protection was overall superior to Bismarck's, although the latter had a .6" advantage on the main belt. The only way Iowa could lose was if she was taken by surprise, despite having better radar, or suffered some odd malfunction like South Dakota at Savo. Of course any ship could be defeated in that case. ??? My impression is that Kimmel was a decent battleship admiral. He and Short were surprised at PH but that doesn't mean in a war time encounter like this they would be at a huge disadvantage, the same can be said of Mac. I'm blanking on the other two right now so will hold comment on them. Then there's the question of how a KM battleship manages to get in range to surprise her. It's far more likely to be the other way around. The USN used radar actively on pretty much all it's ships. The KM was rather reluctant to use it's search radars. As for getting blinded Iowas did on occasion have radar problem (at least once due to their own guns) but the Germans did as well and the Iowas carried multiple copies of their radars. Iowa also had some pretty decent optics. Bismarck or Tirpitz would have a rate of fire advantage in a close fight but that's about their only advantage. The USN doctrine was to fight at long range and the use of radar and air search are going to make that far more likely than a close in fight. Crutchley was a British admiral seconded to the Royal Australian Navy who served as commander of the covering force at the invasion of Guadalcanal/battle of Savo Island. At the time of the attack, he had gone to confer with Richmond Kelly Turner, commanding the amphibious force, about Fletcher's decision to withdraw the carrier force. The suggestion seems to be that this makes them exemplars of the sort of commanders enemies sneak up on. I was wondering, as kimmel, short, macarthur, crutchley and turner were all of very different "molds" of officer. I also doubt that the Admiral would be the one "fighting" the Iowa, as that would be the Captain's responsibility. well, surigao strait was a battleship engagement deluxe with calm seas and weather. radar-equipped BB's in line formation will flatten any target that comes within range. but for my iowa-bismark duel, i'd say a rough and stormy north sea encounter wherein one's advantage of radar and long-range shooting will be rendered useless; and the combatants will have to come within sight of each other, belt it out while closing the range, and see who shoots better and who can take more punishment. my guess is bismark and iowa in that order.